The Mike Leake era ended last week as the trading deadline approached. No doubt having read my call to trade him (for the good of the Reds and for Mike Leake, himself), the Reds shipped him early Friday morning to the Giants in exchange for RHP Keury Mella and 1B Adam Duvall. Mike Leake has been a favorite of mine since he was drafted out of Arizona State. While he's always been in the background behind guys like Cueto, Latos, Arroyo, and Bailey, Mike Leake was involved in all three of the Reds' playoff teams in their recent run (2010-2013). He literally contributed from day 1, making the Reds out of spring training in 2010 before he'd thrown a pitch in the minor leagues. He's been remarkably consistent over that time, with a predictable recipe: he doesn't strike out a ton of batters, but he doesn't walk guys either, and he gets a lot of ground balls. He's been particularly good over the past two seasons as he has gotten his ground ball rate up over 50%, and even spiked his strikeouts to almost 7 k/9 last season. 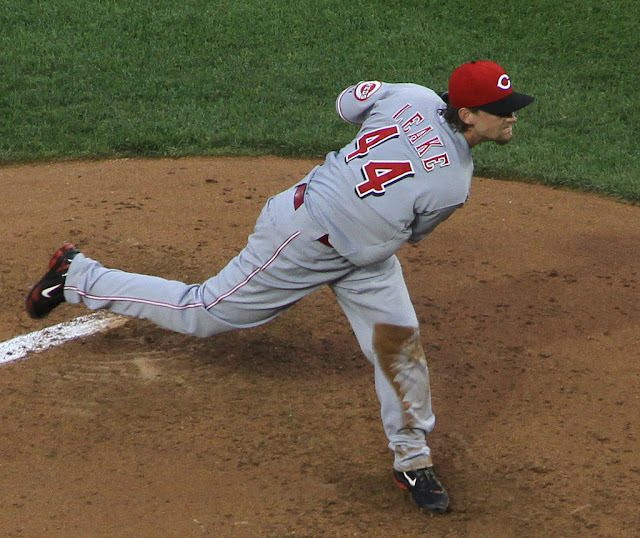 Despite his smaller frame, Leake has never really had injury problems. He has been dependable, reliable, and as consistent as a mid-rotation starter will get. He has always seemed like a good guy, too, despite his stupid shoplifting incident early on (which now is hilarious, in hindsight). I'll miss him. San Francisco should be a great fit for him (he will never give up home runs! ever! ), and I'll be cheering for him to get a nice payday this offseason with some deserving team. He might end up being one of the better free agent deals; a still-young pitcher with reasonable inning totals, no injury history, and a guy who uses his defense. The Pirates would love him, though I don't know if they'll be able to afford him. Mella began the season as the Giants #4 prospect according to Baseball America, and by midseason they ranked him #2 in that organization thanks to improved secondary pitches. Other prospectors have him #1. Unfortunately, this is the problem with team prospect rankings: not all organizations are created equal. Despite being one of the best prospects the Giants could offer, Mella most likely ranks behind two of the prospects the Reds received from the Royals for Johnny Cueto. Kiley McDaniel rated him as a 45 future value prospect, noting that he had a violent dilivery and limited room to continue to develop. Nevertheless, the results have been consistently good for Keury as he has moved through the Giants' system. He is set to crack 100 innings for the first time this year, and is still just 21 years old. The Reds hope he can stick as a starter, and noted that he can probably be a guy who moves quickly. Since being drafted out of the University of Louisville (he's a native of Shively, KY, which is along the inner interstate loop around Louisville), Duvall's calling card has been his power. He hit 30 home runs in 2012 for the Giants in high-A, and has sported .200+ ISO in all but his first minor league season. The primary problem is that he doesn't have a lot of other skills. He doesn't field well, though the Reds will see if might be able to play corner outfield. His strikeout rates don't really look too terrible for a power hitter, but he hasn't been walking very much since reaching high-A. This year, his walk rates are down even further, dropping from 8% in 2012-2014 down to 6%. His upside looks like a potential bench guy who can provide power; that's something the Reds haven't really had since Chris Heisey was shipped to the Dodgers. In my piece at Redleg Nation on the Cueto trade, I pulled up a set of comparable mid-season rental pitcher deals. Leake would rank well behind guys like Cueto and Greinke, but fits pretty nicely with names like Matt Garza, Scott Kazmir, and Ricky Nolasco; guys who can provide roughly 1 WAR over two months' time. ZiPS has Leake as providing 0.9 WAR of value over the rest of this season, which seems right to me. How does this deal compare to those ones? The Scott Kazmir return seems to be much better than what the Reds got. Kazmir is having a nice season, but to net a 50 FV catcher (even one who might not be able to catch) along with a 40 FV pitcher is really good for him. Garza's return also looks better, at least given what they knew at the time. Grimm was a MLB-ready pitcher, albeit one who hasn't worked out so far in their rotation. Mike Olt was a top prospect having vision problems, and again seems to not be working out. But he still had a lot of pedigree at the time. The return for Leake seems fairly comparable to what the Indians got for Justin Masterson (a 45 FV prospect, although in that case an outfielder), or the return for Jake Peavy last summer (Edwin Escobar as a falling prospect, Heath Hembree as a marginal one). It seems clearly better than the nothingness the Marlins received for Ricky Nolasco in 2013. So, based on all of those comparables, I see this is as a fairly even return given Leake's value. We'll just have to hope that the Reds are right and Mella is able to stick as a starting pitcher. If so, it'll look like a great deal a few years from now. If not...well, a good bullpen arm still might be the best return the Reds could hope to get for Leake, given that he might well accept a $17 million qualifying offer if they had given it to him this fall.